A graduate student from the Early Childhood Cognition Lab, Nadia Chernyak, conducts a study with a child participant. Photo by Sciencenter. Mariel Schneider, a senior at Cornell University working towards her Bachelor of Science degree in Human Development, has played an integral part in Cornell University and the Sciencenter’s project, Science from the Start: Engaging Researchers, Undergraduates and a Science Museum to Research Early Learners and Set the Stage for STEM Learning. The overall goal of the project and the partnership between the Sciencenter and Cornell University’s Early Childhood Cognition Lab (ECCL) is to develop and refine tools for parents, caregivers, and educators to engage their children in STEM learning, and to motivate young Sciencenter visitors to search, question and explore the museum. I have been involved with the SENCER-ISE project, taking place at the Sciencenter in Ithaca, NY, for over 6 months now. It has been a unique experience partnering with the Sciencenter through the Cornell University’s Early Childhood Cognition Lab (ECCL) because I have been a research assistant in the lab since my freshman year. The ECCL is a research lab in the College of Human Ecology at Cornell University. As stated in our lab’s website, we study how children develop their understanding of cause and effect through their everyday experiences. ECCL researchers play games with children in our lab, local schools, and day care centers, using toys and stories we design, to discover how children learn. I have been able to apply the ECCL’s findings, as well as the results found in other young childhood research studies, to the project at the Sciencenter. Visitors at the Sciencenter splash around in a Curiosity Corner exhibit- an area specially designed for children 4 years and younger. This will be one of the water exhibits featuring the new signage. Photo by Sciencenter. One of the foundational ideas of early childhood cognition is that if a trusted adult labels two things with the same word, young children expect these things to have commonalities. We are applying this idea by labeling different exhibits at the Sciencenter, which have a common theme of “water,” with the same signage. I first collected initial observational data on child-caregiver interactions, the number of people visiting the Sciencenter, and which exhibits were visited most in a given area of the museum. Michelle Kortenaar, Director of Education at the Sciencenter and Co-PI on the SENCER-ISE partnership, and I designed potential new signage for these exhibits. I have begun to get feedback from children on their understanding of the concepts we are working with. 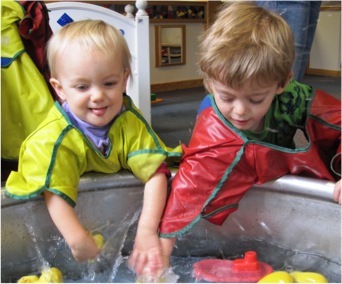 By showing child visitors pictures of the signs we want to use to demonstrate “water,” we can get an idea if the pictures and words we want to use are comprehended by young children. The purpose of the new signs is to indicate to visitors that there is a connection between the labeled exhibits. Based on the children’s reactions, I am going to put up the sign they most consistently identified as “water.” The sign, which shows a picture of water and the word “WATER” spelled out, will go up in five exhibits that feature water. The next step will be for the current students in Tamar Kushnir’s, Evalyn Edwards Milman Assistant Professor at Cornell University and Co-PI of the SENCER-ISE partnership, class to collect observational data on the use of the signage by visitors. Michelle and I have come up with guiding questions, with Tamar’s approval, on what the students should look and listen for from visitors regarding their interactions with the new signage, and the interactions between child and caregiver. Since regular museum visitors are being used in the study, the groups of children being observed interacting with exhibits labeled with old signs and new signs will be different. The best part about working with Cornell University’s ECCL and Sciencenter is seeing how research is applied in a venue that serves the greater Ithaca community in educating its young children. The partnership has informed the direction I would like my career to take after graduation. I have learned that I enjoy designing projects after coming up with a vision that benefits the health and education of people –both children and adults. After graduation, I will be working in healthcare where some of my main responsibility will be in helping hospitals become more efficient in order to provide better care to patients.